High Performance Conveyor Belt Industrial Shredder. Level 3 / P-3 Crosscut shredding with Touch Screen Control Panel. 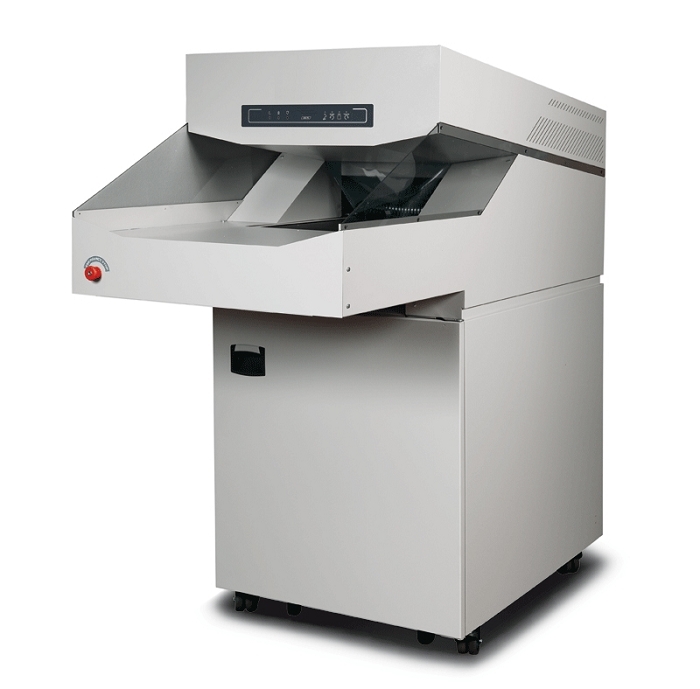 Designed for high throughput and continuous duty operations the VX-30 is suitable for centralized or archive shredding. 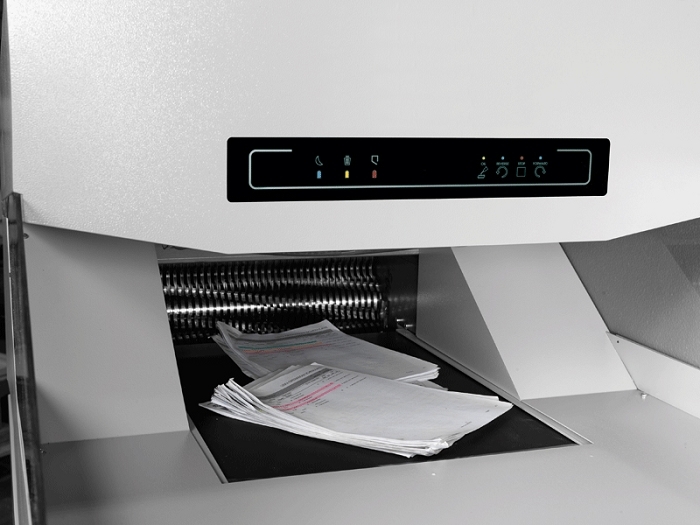 With precision designed cutting knives and heavy duty chain drive with steel gears, the VX-30 easily shreds up to 120 sheets of paper, Card Board, Folders, Paper Clips, Staples, DVD/CD, Blue Ray, Floppy Disks, Credit Cards and USB memory sticks. CONTINUOUS DUTY: Motor with thermal protection for maximum durability. 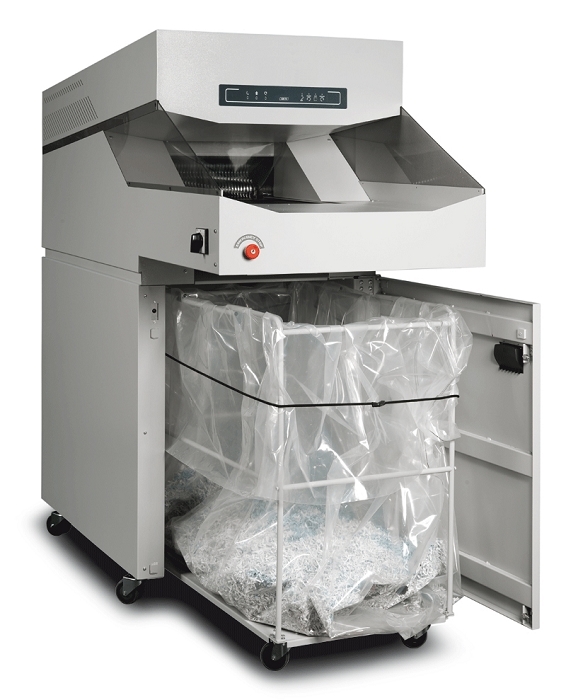 TOUCH SCREEN CONTROL PANEL: Touch Sensitive Controls are fully sealed for dust resistance and easy cleaning. 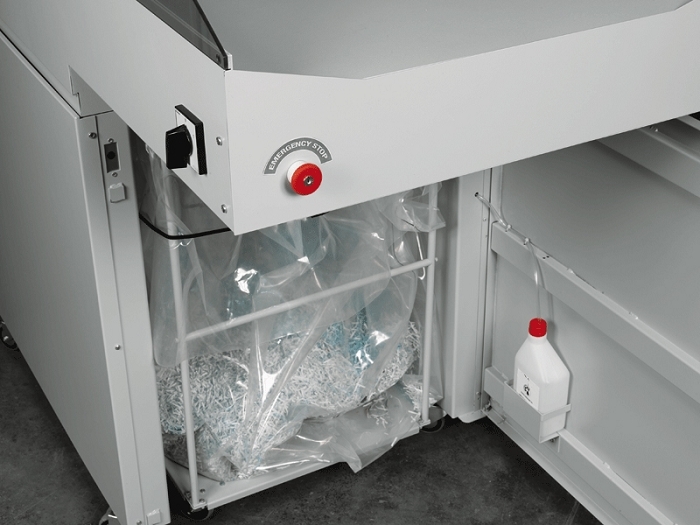 SAFETY STOPS: Automatic stop for convenience and safety when the waste container is full or when the cabinet door is open. AUTOMATIC REVERSE: Automatically reverses the feed in case of accidental jam. AUTOMATIC OILER: Integrated standard fully automatic oiler guarantees maximum cutting and power consumption efficiency. CLEAR VIEW: Clear and strong see through guards on both sides of the work area gives the operator a complete and safe view of the shredding operation. CASTER MOUNTED: Sturdy waste container with Flex Volume mounted on casters for easy removal and disposal of the shredded material.